Let's talk about San Diego for a minute. I expected San Diego to basically be paradise. Perpetually warm weather, sunshine 360 days out of the year, a city on the bay, what's not to love? San Diego was all of these things, but it wasn't quite what I expected. La Jolla was way more of what I expected San Diego to be. 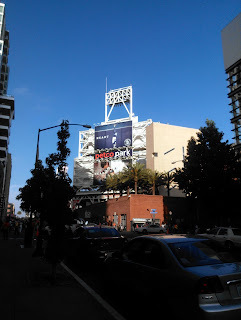 That's not to say that I didn't like San Diego, it just was different than what I had imagined. In a city that is always warm and sunshiny, I expected their baseball stadium to be absolutely stunning and everyone to be happy all the time and wonderful. Woah was I caught off guard. The baseball stadium is gorgeous. The baseball fans are some of the worst fans I have ever come across in baseball...and I lived in the Mets/Yankees/Phillies trifecta for half of my life. Let's start with the stadium. It is literally in the middle of downtown. 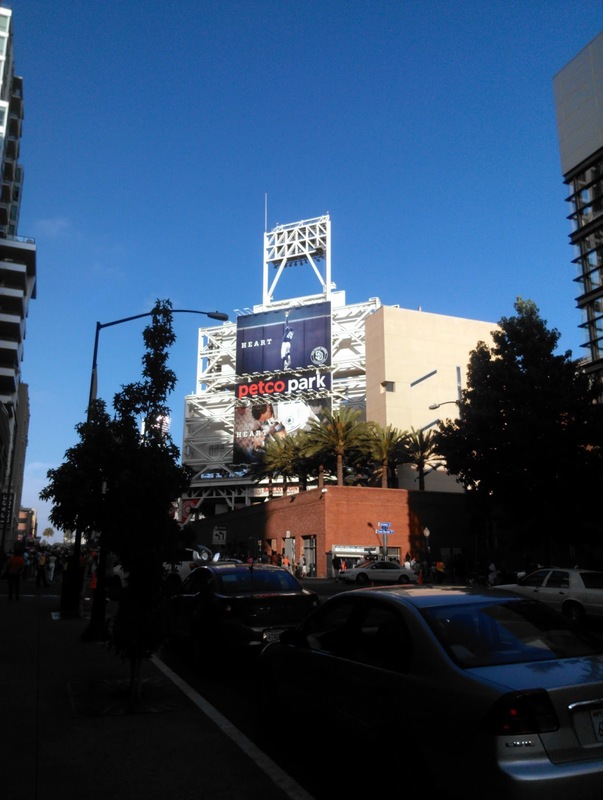 My mom and I had dinner in the Gas Lamp District and our waiter laughed when we asked him where the stadium was. It was one block away. It was 'Fedora Day'...weird, but ok...the fedoras are actually really cute and I will definitely be rockin' mine on straight hair days this summer. We walked into the stadium, and immediately went to the Team Store so that I could buy my pin (I've been collecting them at each part and am going to display them in a shadow box by order of when I went there once I'm done) and then made our way around. The ballpark actually has a huge...sidewalk (for lack of a better word) where they had food trucks and stands, a live band and a big park area where people were picnicking. They even had a little league field! 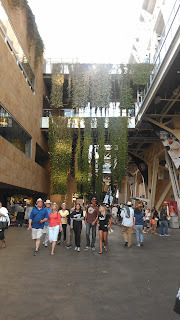 It felt way more like a park than a baseball stadium but I really liked it! Somehow (Stubhub) we managed to get Box Seats for $50...probably because the Padres are one of the worst teams in baseball. The area around our seats felt a little bit like a hotel, but in a good way...I think (the jury is still out on that one). Our seats had a great view of the park and a waitress...which was not at all as glamorous as it seemed. She was way more interested in flirting with the men in our section (about 25 years her senior) then actually taking orders or bringing anyone food. The two guys who were sitting next to us were ordering from her and the guy next to me literally hit me in the face twice in the process of reaching his arms across to to give her his credit card and talk to her. 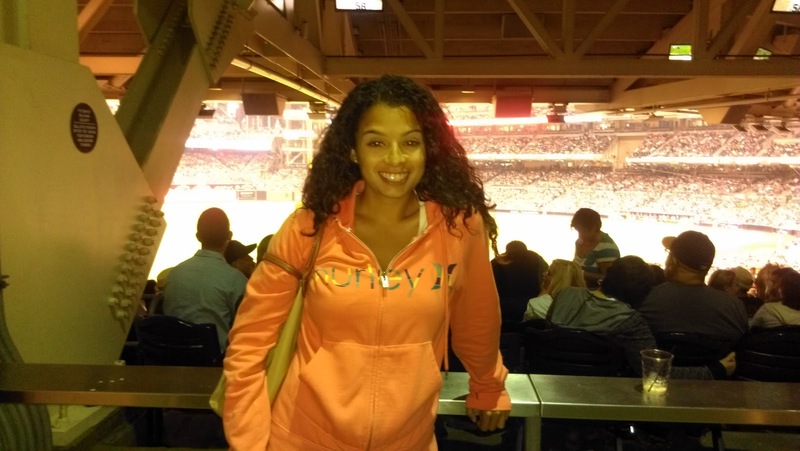 She never once said a word to my mom or me, which was fine because I'm not one to be catered to at a ball game. So the game starts (yes, this was all before the game started) and in the first inning, the Padres scored there one and only run of the game. So, I stood up and started cheering. 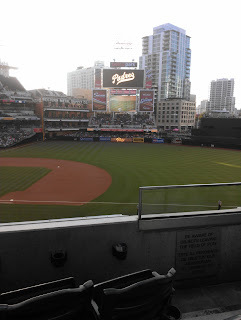 The guy behind me, dressed head to toe in Padres gear, yelled "Sit the hell down!" Ummm what?! We're at a baseball game and I'm standing because YOUR team just scored a home run. I'm sorry for blocking your view of him running the bases. Genius! What's more American than baseball and apple pie? 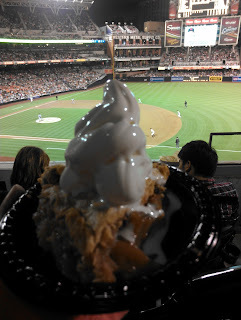 This is the best food find I've found at ball game, hands down! 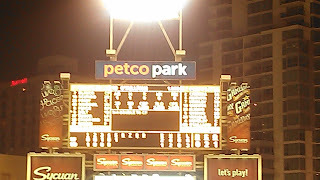 One thing that I didn't understand...during every Giants' at bat, the Padres would display some info about the player on the scoreboard...the GIANTS player. Some of them were about their baseball career, others were just really random facts about them...like the fact that Gregor Blanco has brothers named Gregory and Gregsman. When the Padres were at bat though, they didn't give you any information about the Padres players. 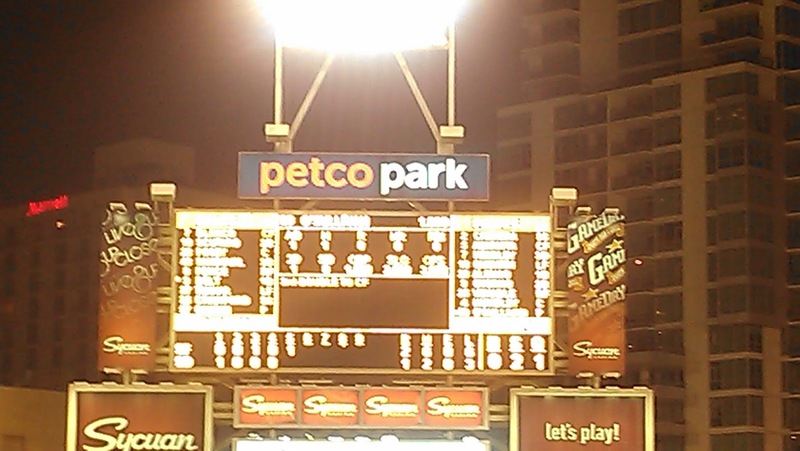 The Padres don't have at bat songs either, which was strange. I get that they were playing another California team and that a lot of the fans were Giants fans, but why would you display info about the other team without giving some info about your own players? It was really weird. The Padres pitcher was a rookie pitching his first game in the Majors - losing 10-1 is not how you want to start your career - and hit a triple on his first at-bat, giving him a batting average of 1,000. If you look closely below, you can see it. I just thought that was pretty cool! I've never seen someone with a 1,000 batting average! I like the Giants (my sister lives in SFO and her husband is a huge Giants fan) so I was really happy that they won, especially given how awful the fans were. I wish I could say it was just the fans, but the hospitality was just as bad. Between the waitress and the ushers who didn't bother showing us to our seats when we asked, it just wasn't a good experience. As my Mom and I were walking out of the park, we could see the bullpen pitchers warming up (we left just before the 9th inning, I honestly just couldn't take the people in our section anymore), so I stopped to take a picture and an usher came over and said "Walk down the stairs NOW." I said, OK just a minute, and tried to take the picture again and he said, "I said NOW" to which I just stormed out of the stadium. I was done. As awesome as the fans at Dodger Stadium were, the fans at Petco Park were equally bad. It's one thing to have rude and obnoxious fans, but when your hospitality staff is just as bad? That's a deal breaker. They get an A+ for the stadium and food, but that's about it. I don't think I would go back to Petco. 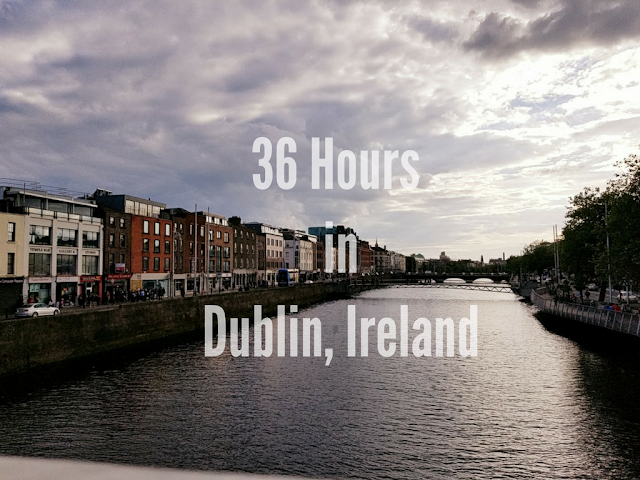 (Holly visited this season and had a similar experience.) 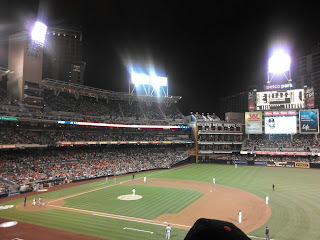 I wouldn't call it one of the worst parks I've been to, but fan experience is a huge part of a game, so it's definitely going to be ranked toward the bottom for these reasons and because of the fact that the park catered more to Giants fans than Padres fans. So there you have it. 22 ballparks down, 8 to go! 8! I was at 18 when this season started, and now I'm at 22. There are at least 2 1/2 months left of baseball season. Who knows where I might go between now and October! Only 8 left? That's incredible! Which ones do you have left? I'm so sad I missed you coming to Cali - just barely getting into the state myself, but I hope you can come back and have a better experience. I love your mission of seeing all the ballparks. I live about 2 hours north of San Diego so I grew up going to Angel and Dodge stadium, but have never been to Petco. I did go to a football game at Qualcomm last year and the Charger fans were actually not too bad (being I was decked out in Cowboy gear) but the stadium is really old.